I love shoes! I’ve loved clothes, shoes and everything fashion since my early teens and spent close to two decades of my life nurturing that passion through a fashion design business in New York. One day, several years ago, I had an epiphany when I noticed several pairs of shoes of the same color in my closet, amidst a collection that reflected every hue in style at the time. “You are a shoe junkie, Danielle!” How many pairs of black shoes does a woman need any way? I vowed to be more sensible, scaled back my impulse purchases and thought I was cured until an incident this summer. One morning this past July, I was looking through the original boxes and clear plastic ones that contained my shoes and eyed an unfamiliar red box at the bottom of the closet and wondered which shoe that was. I opened it, and there was a brand new Adrienne Vittadini, picked up at Burlington in early February! White sandals, perfect for Houston’s scorching summer that began early in April this year. My curiosity piqued, I lined up every piece of footwear for a count. 56 pairs of shoes and sandals, 5 winter boots, 1 hiking boot, 4 sneakers, and for the house, 4 winter slippers and 3 summertime flip flops. Whoa! I only have two feet. There are 31 days in a month. Yet I own over 70 articles of footwear. Granted I shop very judiciously (discount stores and seasonal sales) and never pay more than $65 for shoes or over $150 for boots. But still… When I shared that information with my sister, she was unfazed by the revelation. “Well, that’s about average for an American woman,” she said. Average! Over 50 shoes? Ladies and gentlemen, I give you exhibit A for conspicuous consumption on a national scale! I began to think about the many in third world countries or even here on our blessed shores, who can barely afford footwear. I’m a consistent giver at church and donate to charities, yet I couldn’t help the pang of guilt in my gut. Like most women I treat myself often. I work hard for my money. I deserve it, right? Yes, but, something didn’t feel right. Then it came to me! Every time I find myself engaged in too much self-indulgence, I would deflect the focus on self with a random act of kindness or donate to a charity. A week after that decision, I stopped by Fiesta, a supermarket located in a low income neighborhood where I usually pick up tropical fruits and vegetables. A neatly dressed elderly man holding a pack of Ramen noodles approached me at the register. He asked if I could help him buy some food so he could take his medicine. He’d recently been released from a hospital stay. “Sure,” I replied without hesitation. “ As a matter of fact, why don’t you go ahead and get a week’s worth of food. I’ll wait right here for you.” His eyes lit up like a 5-year old who was just handed a strawberry lollipop. “Thank you, Ma’am. God bless you,” he said and rushed off with a shopping cart. When he returned, the cart was loaded with goods: packages of chicken legs, beef chuck, eggs, a loaf of bread, a gallon of milk and various canned goods in addition to his noodles. “I got the cheap cuts of meat,” he said by way of apology for the large cartons. “It’s alright,” I reassured him. “God has blessed me so I can be a blessing.” I noticed he had no fruits in the cart, I grabbed some apples, oranges and a bag of potatoes from the nearby stalls and added them to the belt as the cashier rang his items. The grand total for this man’s week worth of groceries: $37.25. Far less than a pair of shoes, on sale, at Macy’s. 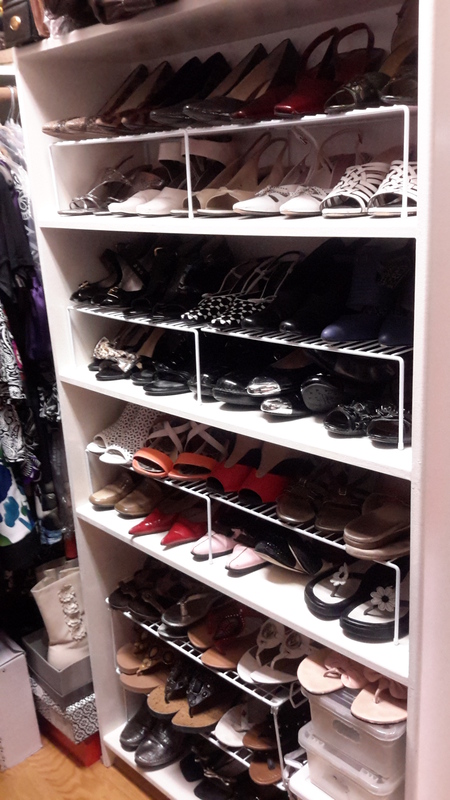 My footwear collection has since been smartly re-organized, out of the boxes, and more visible. But for the next several months, I will be on a self-imposed hiatus from shoe shopping. Til next July. I know that some oh, so cute and temptingly gorgeous pedary work of art will wink at me from internet pages or their pedestals at various stores. I will feast my eyes on the beautiful display, inhale deeply and keep moving. “You are ‘magnifique’! But no thanks.” One of them fifty or so bad boys in my closet will do just fine for a fashion statement. When I visited Haiti later in July, I took one suitcase full of nothing but footwear (men, women and children), bought specifically for donations. The smiles on the recipients’ faces replaced my earlier feeling of guilt with the most exquisite sense of gratitude for being in a position to give. At the end of my shoe fasting season, I’ll try not to binge. I will be clipping coupons in June in preparation for the sales. I will treat myself to the most delectable, exquisite little treasure of a shoe I can find for under $65. My toes twitched a happy dance just thinking about it! Do you have a fashion fetish? Has a fashion experience inspire you to do something outside the box?